Although most of Leiden University’s special collections contain works on paper, there is also the photographic technology collection, unique in its kind in the Netherlands. Around thousand cameras and additional studio, developing, printing and projecting equipment, shed light on the way photography was produced since the nineteenth century. In the second half of the nineteenth century and the beginning of the twentieth century, before the illustrated press would take over its role, stereo photography was immensely popular. Stereoscopic photos were taken with dedicated cameras, which had two objectives with the same distance between them as exists between human eyes. When viewed with the appropriate binocular apparatus and focusing of the eyes, the scene on a stereoscopic photograph is viewed with a very strong suggestion of three-dimensionality and depth. Around the turn of the nineteenth into the twentieth century, Dutch Major General Lieuwe van Albada, set out to bring stereoscopic photography to perfection. In 1896, this autodidact at photography began to publish papers on stereoscopy, photographic exposure and image projection. He experimented with all sorts of designs, self-built bodies and lenses to create a stereographic camera that would produce the most naturalistic image possible. He found out that a wide-angle view provided the best illusion of depth. In 1902, his designs for a wide-angle stereographic camera were patented. It was taken into production and introduced on the market by Amsterdam-based camera manufacturer Schaap & Co. Later, Van Albada’s activity turned international, when he designed wide-angle lenses for Zeiss, invented a new type of camera viewfinder, and assisted on the development of three-dimensional videography at the film processing company Technicolor in Hollywood. 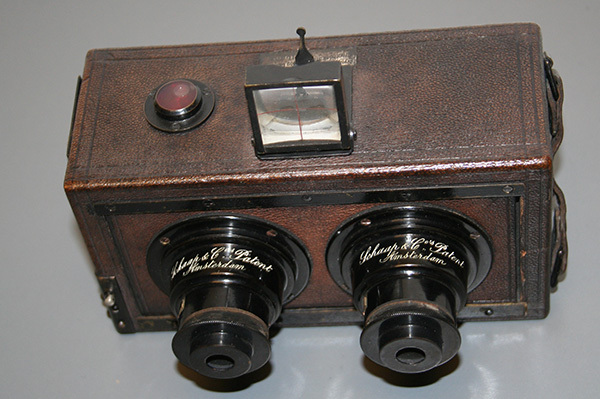 Of Van Albada’s Dutch wide-angle stereographic cameras, only a few examples have remained worldwide. What is truly special, however, is that Leiden University’s special collections also holds Van Albada’s entire personal archive. Besides elaborate correspondence with manufacturers and others, there are also hand-drawn designs and two boxes of wooden prototypes of this stereographic camera. Together, the material illustrates the entire road from concept to physical object, and traces the development of the Netherland’s first stereo camera. Photo’s: Aart Kinds. 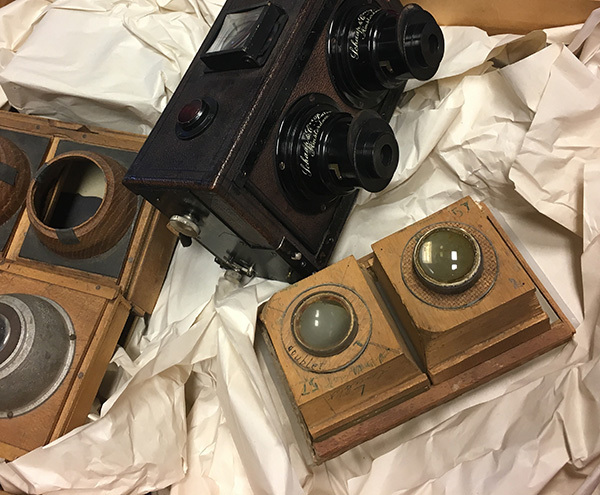 Group of objects in the Leiden University Libraries’ special collections, with designs and manufactured prototypes of the Netherlands’ first stereographic camera (1902, PK-F-58.208) by L.E.W. van Albada.